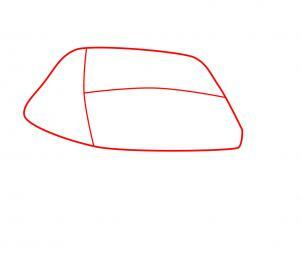 The first thing you want to do is draw out a mound shape which is a rounded pyramid shape. 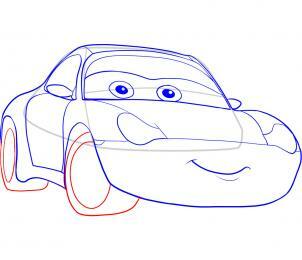 Draw in the guidelines for the windshield and then move to step two. 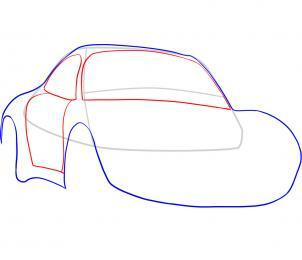 Now using the guidelines and shape you drew in step one, you can now start drawing out the outline of Sally's car body. As you can see this should be a very easy task to accomplish. Once you are done move to step three but don't forget to draw in the wheel wells. 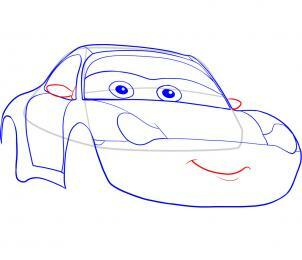 Here you will draw in the windshield, and the passenger side door window. 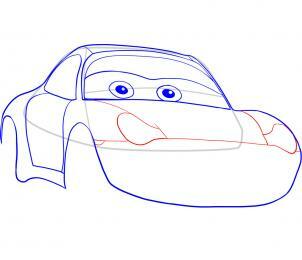 When that is done draw in the lining that forms the passenger car door, and the framing for the windshield. 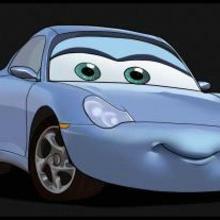 Now it's time to really make Sally look like her beautiful Porsche self. You can do this by drawing some lids, and then draw in the eyeballs and color in the pupils. You will also need to add some detailing to the roof. 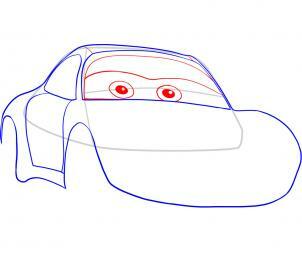 Sketch in the hood detailing lines like so, and then draw out the headlight housing sockets like you see here. When that is done, draw the bumper lining and move tp step six. You are almost done with tutorial. As you can see all you have to do is draw out the side mirrors, and then draw in the mouth. Add that little dimple under the bottom lip to give her mouth depth. This is the second to last step before you complete the lesson. 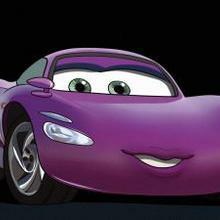 The only thing you need to get drawn here is the two tires. 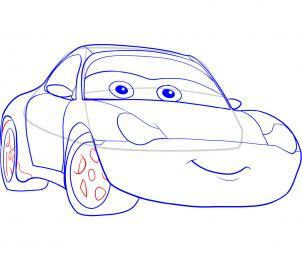 Once you get those tires drawn in, you need to draw out the rim lining which makes the tire thread sort of thin. The last drawing step is very simple. As you can see you need to draw in the holes that makes up the factory installed rims. Add some detailing and definition, and then begin erasing the lines and shapes that you drew in step one. 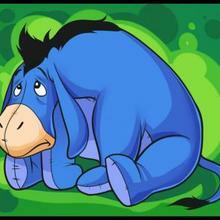 This is what Sally looks like when you are all done. 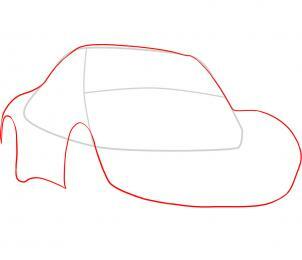 Now you can have even more fun as you color in this Porsche to perfection. Now that is all done, you can move onto another fun lesson because you just finished learning how to draw Sally.